I finished reading “The Kite Runner” a couple of days ago, and finishing, was a bit of a relief. It was one of those books I had to put down a few times, regroup and carry on. So this 372 pages piece took me 2 weeks to get through, which is quite long for me. Until, I opened this book, I had no image of Afghanistan in my head that was not associated to bombings and destructions, since this is sadly the current state of affairs in that country in 2015. Looking at Afghanistan through the eyes of the writer, where the country is described as bountiful and rich with beauty for at least a good significant period in the first part of the book was an eye opener. And as a reader, it was an admission of my ignorance. Admittedly, I preferred those parts where the author recounted the early life of the main character Amir, a child raised by a wealthy father, and running kites with his best friend Hassan. However, even while telling readers about those seemingly wonderful moments, Khaled Hosseini skilfully drops his own bombs. And this was it for me, as tragic events unfold I am forced to take a moment before I can go on with the book. When I pick it up again, the only thing on my mind is:” when is the next bomb going to drop?” This rhythm is constant throughout the book. You are lulled into a false sense of security with a reminder that it is not so, coming up just at the right moment to keep you on your toes. As the book near its end, you are not even sure how it is going to end. Next Post LaChouett: Wrap it up January 2015!!! 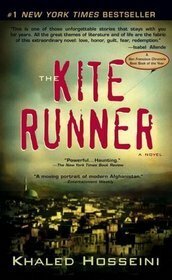 Virginie: I read The Kite Runner in college and thought it was a bit over-hyped but still a good book to read. I will always, however, associate The Kite Runner with one of the most god-awful shows that I have ever seen: a one-man performance version of The Kite Runner that was literally the first 30 pages memorized and read allowed to the audience by an Arab-looking actor wearing a traditional robe and sitting on a stool the whole time. And it was on my 21st birthday, no less. I needed so much alcohol after that. What? A Kite runner one man show! Oh my god! Lol, I am sure it is hilarious, but surely AFTER the alcohol. It was horrible. The actor wasn’t even that good. I feel sorry for you lol. I think I might write a blog post about that experience soon. Or maybe I shouldn’t, considering how awful and boring it was. At one point, I want to say that 2/3 of the audience was fast asleep. Maybe you should, it would show a different perspective. Another book turned into a movie! His second book, “A Thousand Splendid Suns”, tells the story of Afghani women. A non-fiction book to consider reading is “The Bookseller of Kabul.” We read these for book club some years ago. I have to admit that after this read, I need something fantasy like. Something to help me get over it. Reading the #bluekite scene was very unpleasant! I totally know what you mean. I read this in high school and a few breathers was definitely necessary. Grats for finishing it!